Summer flowers like penstemon are budding. And peonies will be blooming any second. The old apple tree, whose stump I turned into a birdbath, won't die. It sends up suckers all along the root system and I've decided that this fall I'll need to dig up this entire area and have the stump ground out. I should have done that from the get-go. Or maybe when I was already having stumps ground out last fall, since that would have been way cheaper. Sigh. 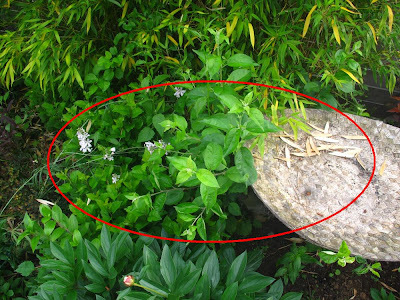 I also sort of suspect that The Stump That Won't Freaking Die Already is the only thing keeping that bamboo clump behind it in check. I'm thinking about removing the bamboo, too. I've been obsessed with the chartreuse smokebush Cotinus coggygria 'Golden Spirit.' I think it would look pretty in the shrub hedge, possibly trained into a tree. The problem with planting a lot of tulips is that the greenery sticks around a lot longer than the blooms. I've been waiting for the foliage to die before pruning back the hundreds of tulips I planted in the yard, which means everything that used to look like this . . .
. . . now kind of looks like this, which is to say: messy. So. much. visual. noise. ugh. i. can't. even. That gaping hole between the stringed-up Cryptomeria and the ninebark is where I pulled out a flowering currant and planted a wee huckleberry. The lady at the Audubon sale told me that they are fussy and difficult to get started and "I should plant it over a rotten log," as if normal people have those lying around. Except it turned out I did have a piece of rotting wood from The Stump That Won't Freaking Die Already! Let's hope it doesn't reanimate and start suckering over here too. The elderberry that I moved, only to have it make a giant sad, is rebounding. No, really, this is an improvement. The doublefile viburnum (I think it's Watanabe?) I planted to the left of these two elderberries, was planted as a privacy shrub. 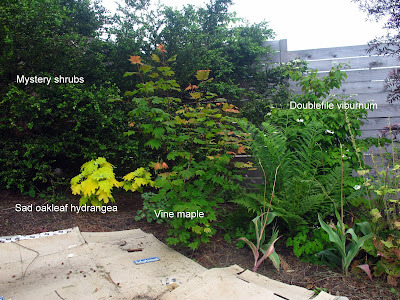 Viburnums aren't privacy shrubs, they are specimen plants! They are beautiful and deserve to be front and center, not sandwiched in the back behind a vine maple. I'm smothering the lawn here to increase the size of this bed. This part never looks good. I sort of think I should move the vine maple to the center of this cardboard-covered area, since I'm moving everything in my yard around. It just sat there for two years, not getting much beyond a foot tall, and now that it's putting on some growth I think it's time to shock it. That'll teach you to thrive in my yard! I'll move you, in June no less! I'm also tempted to move the viburnum but I think the cedar tree will steal too much water from it. In conclusion: I don't know what I'm doing, so I'm rearranging everything. Who wants to help me dig? Who has a better plan that doesn't involve angering established shrubs? I have removed ever single sucker this stump puts out without fazing it. Round Up isn't an option so I have to have it ground out. But I will have more room for plants! You have a classic gardener's to-do list ... nothing ever looks as good as you want or envision. I'm a chronic plant mover, my current goal is to achieve right plant, right place the first time. You're KILLING me with that Penstemon photo! I almost bought one this spring...but put it back because I just couldn't think of where to put it...argh! As for the Tulip foliage...yes, it's always a bit annoying around this time of year, isn't it? Luckily, I somehow managed to plant just enough to get a show, but not enough to create a huge mess...by the time they are fading, the surround plants pretty much cover them up...wish I could say the same about my damn daffodils! I have a few bare spots right now as well...plants that, for whatever reason, were REALLY late coming up (like 2 freaking months later than usual), so the garden has these 2 or 3 black holes right now, sigh. BTW...I love the Allium schubertii! I can't tell you how much I enjoy seeing you post about changing your mind and moving things around. I do this all the damn time and I always wonder, why didn't I think of this the LAST time I was redoing this area/complaining about re-digging/whatever. Things are looking really great in your garden! Don't despair--your elderberry will be going great guns by next year, I'll bet. I moved mine two years ago in the heat of Summer and it was so pathetic looking but two years later it's like a majestic tree. I need to give it a good hair cut this year but I'm going to wait until Fall. Such a great plant! Also, that penstemon is amazing! That's going on my wishlist for sure. I'll probably do it over and over again, so I'm glad you're enjoying it! Have you started installing your rain garden yet? I can't wait to see it! Never cared much for penstemons, but THAT ONE...oh my! The seed pods on that one are really cool, too.